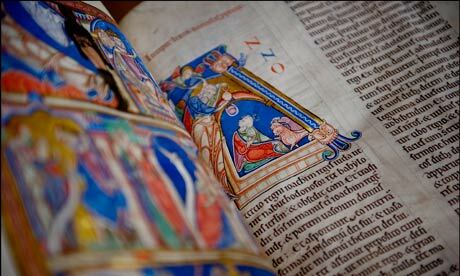 For 400 years the library of the archbishops of Canterbury at Lambeth Palace has kept its archives largely hidden, through riots, upheavals, an execution and the Blitz. But nextweek the public will be allowed through the great doors of the palace's medieval Moreton's Tower, then invited to turn left past the fig tree planted by Cardinal Pole in 1555 and enter the palace's great hall, where Thomas More refused to submit to Henry VIII, to see for the first time an extraordinary exhibition of its treasures. The several dozen primates since archbishop Richard Bancroft bequeathed his collection of 6,000 books and manuscripts in 1610 have left quite a horde – and not just of Bibles. The collection shows how intimately entwined with matters of state, as well as the highly personal, archbishops have been. In the exhibition there are the embroidered leather gloves worn by Charles I on the scaffold at his execution, a book of hours found in the abandoned tent of Richard III after the battle of Bosworth, the angry scribbles of James I in the margins of a book pleading for religious toleration, and the earliest printed book known to have reached England, purchased by William Caxton's patron, the Bishop of Lincoln, in Bruges in 1467.